Beautiful aquatic creatures are the stars of Luminous Life, a lovely looking underwater-themed video slot from Playtech. This 5 reel, 243 ways to win title comes with respins with sticky symbols plus a free spins round with sticky wilds. Dive in on all devices from between 20p and £300 per spin. There’s nothing to grumble about as far as the design of Luminous Life is concerned. The visuals are superbly well done. Set against a deep blue ocean backdrop, you’ll see a collection of marine life spinning around the reels. The most lucrative symbol is the bright orange fish which will get you 5 times your bet if you land 5 in combination. The translucent W is the game’s wild. Land 5 of these and you’ll pocket an award of 12.5 times your stake. As usual, the wild replaces all other symbols apart from the scatter. You can expect plenty of action from Luminous Life thanks to the regularly hitting extras. Luminous Respin feature – this is awarded following every successful spin. The winning symbols are held and you’ll get a respin. If a symbol lands that improves the original combination or you land a new winner, the process is repeated. The respins continue as long as a new improved combination arrives. Luminous Wilds Free Games feature – 5 free spins are awarded if you land 3 or more scatters on the same spin. Any scatters from that triggering spin turn into wilds and remain locked in position throughout your free spins. Free spin scatters can be part of a Luminous Respin combination so it’s possible to land a large number of scatters if the respins fall nicely. If you’re lucky enough to fill the whole of the reels with free spin scatters, the Grand Prize bonus is automatically paid – this is worth 250 times your total bet and is known as the Luminous Grand Prize feature. We liked what we saw in Luminous Life. The visuals are very easy on the eye and soundtrack bubbles along in the background rather nicely. The gameplay stacks up pretty well too. The respins come along regularly and the free spins round with sticky wilds can certainly deliver plenty of action. The online casino world is swimming in underwater themed video slots. 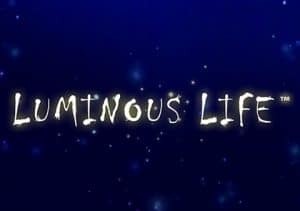 With its high spec design and enjoyable extras, Luminous Life is one of the better ones. Saying that, I like more volatile offerings with Mermaid’s Diamond from Play ‘N Go and Novomatic’s Mighty Trident worth diving in for.